Combine the mayonnaise, avocado, and sweet lime zest and juice in a bowl. Mix until smoothly blended. Season with pepper and salt to taste. Set aside. Place 4 slices of prosciutto on a paper towel-lined plate. Cover with another paper towel and cook in microwave for about 1½ minutes on high. The prosciutto should have the texture of crispy bacon. Place a leaf of lettuce and four cucumber rounds on the first 4 pieces of toast. 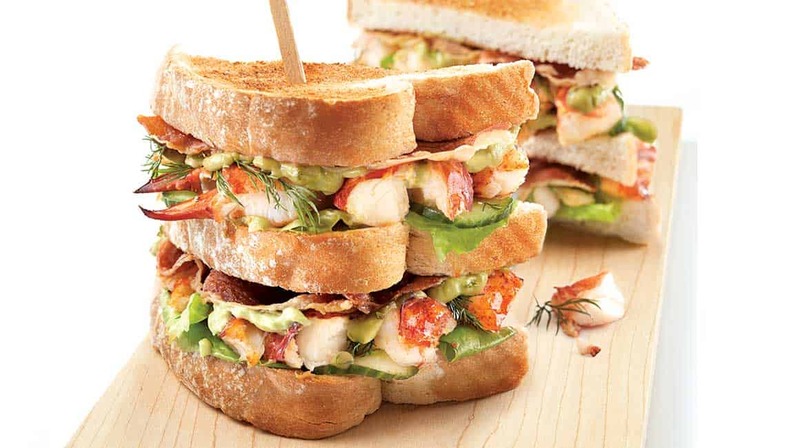 Add lobster meat, some fresh dill, and top with one or two dollops of mayonnaise. Place a half-slice of prosciutto on top. Top the four sandwiches with a second slice of toast. Finish with the 4 remaining slices of toast to complete the sandwiches. Cut sandwiches in halves or quarters and use toothpicks to hold them together. Serve with homemade coleslaw or slices of fresh tomato.